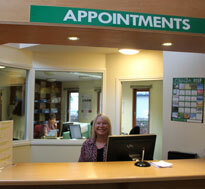 We run an enhanced appointment system with a mixture of pre-booked and on the day appointments. This is split as 75% on the day and 25% pre-bookable. Appointments can be made at reception, by telephoning or using our online service. All urgent cases will be seen the same day although you may not see the doctor of your choice. Doctors consult from 8.30am to 5.30pm. Please be aware that on days of very high demand we may limit the number of pre -bookable appointments. Due to high demand most appointments on Mondays are bookable on the day only. However, there are a limited number that can be pre-booked for your convenience. This is provided daily by Nurse Blackshaw. At this clinic we are able to take blood, dress wounds, ear syringing, new patient medicals and treatment of minor injuries. If you require any blood tests, please make an appointment with one of our health care assistants. The Millig Practice offer extended opening hours to accommodate patients who cannot attend the surgery between the hours of 8.00am and 6.00pm. The surgery will offer these appointments on a Monday morning. These appointments are pre-bookable only. To direct patients to see the nurse or other health care professional rather than a doctor where appropriate. You may only request a home visit if you are housebound or are too ill to visit the practice. Your GP or Advanced Nurse Practitioner will only visit you at home if they think that your medical condition requires it and will also decide how urgently a visit is needed.